Delight your loved ones. Share the joy of shopping at the unique stores in the Klif Mall. 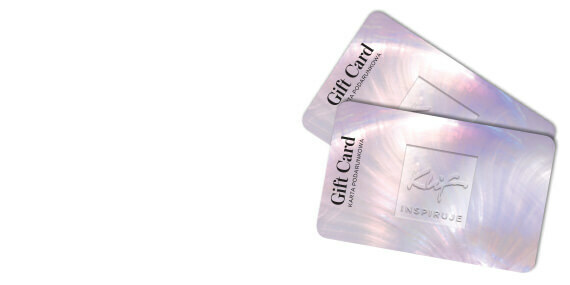 The gift card is an elegant offering for people who love beautiful, original things and value the highest quality. Delight yourself and your loved ones – enjoy the peace and the subtle sounds of the piano, and discover details which transform every shopping experience. The gift card is a pre-paid Mastercard card accepted in all boutiques in the Klif Mall. Gift cards can be ordered at the Information Desk and charged with amounts from PLN 30 to 4000. Gift cards bought online can be charged with amounts from PLN 50 to 1000. Gift cards are valid for 12 months from the date of purchase. You can check the account balance by calling 22 490 69 23, or visiting flex-e-card.pl/sprawdz-saldo and flex-e-card.pl.